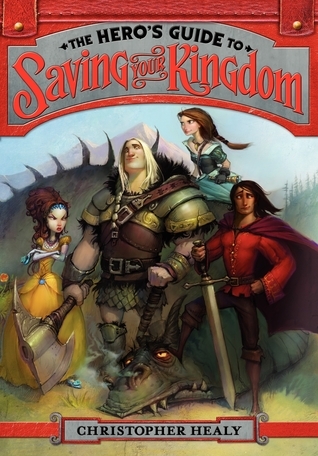 The Hero’s Guide to Saving the Kingdom is now one of my new all-time favorites! In its pages we are introduced to the Prince Charmings of several well-known fairy tales: the male leads of Cinderella, Rapunzel, Sleeping Beauty and Snow White. Frederic was traumatized as a child by a toothless tiger which has resulted in his idea of adventure being a new sandwich on a picnic. Gustav is the youngest of 17 boys (after two sets of octuplets) and feels the need to prove himself a hero–unfortunately he is always trying to fight his way through situations that don’t call for it or in which he is grossly outmatched. Liam believes himself a true hero since childhood, rescues Sleeping Beauty, then discovers she is a thoroughly unlikeable person and breaks their engagement; his ex-fiancé then spreads rumors which destroy his reputation and cause inhabitants of both their kingdoms to despise him. Duncan truly loves Snow White and she, him; the dwarves can’t stand him because he’s not terribly bright and he IS incredibly weird(though well-meaning). Their adventure kicks off when Ella tells Frederic he’s a nice guy but she is bored to death at the castle and needs adventure (other than a picnic). When Ella leaves Frederic realizes he doesn’t want to lose her and sets off to find her. Gradually all four Prince Charmings meet up and settle into a contentious traveling group. they encounter the Bandit King, a ruthless–but depressed–bounty hunter, grumpy dwarves and a powerful witch with a plan to take over their kingdoms. The combination of one’s love of fancy clothes, one’s sweet but child-like excitement over everything (including his first swordfight, his first bandit encounter and the first group of people who don’t run AWAY from him), one’s frustration at plan after plan going awry and one charging blindly into brawls, bandits, trolls and dragons (which results in his hair being burned off) are hilarious. My 10 and 11-year old and I read this as a bedtime reading choice and the three of us could not help laughing aloud at every chapter. My son had another 5th Grade boy sleep overnight and he listened to one of the chapters (from the middle of the book) after which he exclaimed “I have to get that book!” My 5th Grader has christened it “the best book ever” and we are currently reading the second installment (Hero’s Guide to Storming the Castle). I have rarely had this much fun and so thoroughly enjoyed a book as I did reading The Hero’s Guide to Saving the Kingdom. This book has rocketed to the top of my read-aloud list for next year in 3rd and 4th grade. Consistently funny with quirky, funny characters about whom you come to care quite a bit, this is a fantastic read-aloud or independent reading choice for young and old alike. It is a brilliant break from everyday life with its frustrations and responsibilities. I encourage everyone to treat themselves to this rollicking, belly-laughing romp of a book!